It has become so much easier and less expensive to get started programming PIC Microcontrollers that everybody should at some point learn the basics of programming. This page is my attempt to show you how easy it is to get started. PIC16F887 - 40 pin, PIC16F886 - 28 pin, PIC16F690 - 20 pin, PIC16F88 - 18 pin, PIC16F688 - 14 pin and PIC12F683. All these parts are supported by the PBP3 Student edition, Microchip C Compiler and the Great Cow Basic Compiler. They give you a full range of features. All are supported by the PICkit 2 Programming Software and many development boards exist. And most of these microcontrollers are under $2.00. You can get free samples from Microchip. You have many options here depending on how much you want to spend. I personally still like the PICkit 2 programmer for many reasons. First, the design is open sourced so you can build your own if you want. In fact I did that and show the details here. There are many clones of the PICkit 2 available as well so for $20 to $35 you can get a full featured USB powered programmer. If you are a professional and want the latest and greatest Microchip Programmer then the PICkit 3 is the way to go. You have several choices here but you only need one of them. Here are four choices I recommend. This is the compiler I prefer and I use it all the time. You can get this for $49.95 and it supports several parts. There is a gold version that supports all latest 8-bit PICs but that costs $249.95. It's worth it in the long run but I recommend you start with the $49.95 to get started. This is a the C compile from Microchip that you can download and use for free. I use the HI-TECH compiler in my books which was bought by Microchip so all my books will work with this compiler. The XC8 Compiler replaced the HI-TECH compiler and is the latest released 8-bit compiler from Microchip Technology. I'm slowly converting my books over to this compiler. Great Cow Basic is a free and open source compiler that has been around for almost as long as PICBASIC. Its completely free so the support and documentation are limited but I find it a very useful compiler. 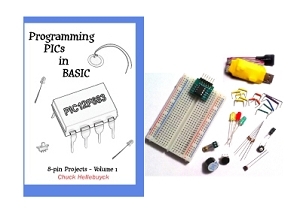 Based on my experience of helping others get started since I originally launched elproducts.com back in 1998, I recommend you consider this package below based on my book "Programming PICs in BASIC"4. My book was written for the true beginner. You can see a sample of the contents at the book's Amazon page. The hardware and book can be purchased as a complete kit at Howtronics.com. The book takes you through seven simple projects that teach the fundamentals of Digital I/O, Analog I/O, Sensors, LEDs, Sound, Vibration and Light. It's been one of my most popular starter kits and many people use this to get started and then eventually graduate to my Beginner's Guide to Embedded C Programming Books. The complete kit retails for $69.95 so its a lower cost way to try out the world of Microcontrollers. I recommend this Programming PICs in BASIC Starter Package. Coming Soon - You can use all the hardware with other compilers such as the Great Cow Basic Compiler and the Microchip XC8 C compiler. I'm working on books for both of those to give a beginner more choices to get started.